I made a quick window card for my son's t-ball coach. I have been trying to use all of my carts so I have been wandering through all of them. I came upon this window card in Calligraphy Collection and decided to use it. I sized it to 7.55w x 4.76h. I took the baseball glove from Sports Mania and welded the shadow of it (1.97w x 1.86h) inside the window opening. I put the glove on the mat along with the baseball sized at 0.70w x 0.65h. I put the baseball bat border on the mat sized at 3.39w x 1.16h. For the font, I used Varsity Letter "Narrow" sized at .88h. I put my papers on the mat. I picked a paper for my card base that is white on the back. You can always cut out the card base in white and also in a patterned paper and just trim off the front side to use on the card. I cut out the pieces. I saved the negative piece from the letters and used it as my stencil. I ran the letters through my Xyron and stuck them on. I pulled up the template and my letters were perfectly aligned! I added stitches to the baseball. I inked the bats, glove and ball. My card is complete! This week's challenge at Frosted Designs is the theme BBQ, Picnic or Outdoor Games. For my project, I made silverware holders for a BBQ or Picnic. I started with empty and clean fruit cans. I used the bigger can and my 4 8/20" x 12" paper was just a bit short. I cut smaller sections (4" x 4 8/20") to overlap both ends. I used my ATG gun to adhere the paper to the can. I printed and cut out three Grills on my Imagine from the Enjoy The Seasons cartridge at 3.8". I backed the grills on a piece of red cardstock cut at 4"x4 8/20" and used my corner rounders to soften the corners. I cut out the words from Cherry Limeade at 1". I tied red and white Baker's Twine around the top and bottom of each can. This is an inexpensive and easy project that will help keep your tableware organized at your next picnic. 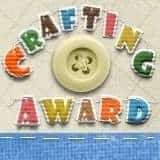 Be sure to join us at Frosted Designs and enter your own layout, card or project for a chance to win some great prizes!! Here is my tri-shutter card for Gypsy Made Simple at ShesASassyLady. On Sheila's blog, you can download the Gypsy file she created in exchange for a donation for the Tornado victims in Alabama where she lives. I started my card before I learned about Sheila's challenge. She motivated me to finishe it and post it!! I started with some basic squares and a tag. My tag is 6.08w x 4.14h (rotated 90 degrees). I hid the slit in the tag. The small rectangle is 1.68w x 3.76h (rotated 90 degrees). I welded a tag from Storybook 2.61w x 3.74h (rotated 90 degrees). My bigger rectangle is 2.99w x 3.95h (yes this one is rotated too 90 degrees) and I welded an oval to the top .89w x 3.86h (rotated 90 degrees). Before I welded these three parts of the card together, I made a separate layer and copied each of the three shapes on it. The first test cut ~ my shortest layer was too short. Second test cut ~ the shorter layer is better, but the middle layer is too short. Third test cut ~ perfect! Here is the layer with the individual pieces on it so I can cut out paper to cover the pieces. You can skip this step if you used patterned 2-sided cardstock for your card base. I wanted a different color for each page so that did not work for me. I put everything together and stickled the details on the birdie and flags. I used twine on the banner. I used the sentiments because I did not have a stamp that worked for this card. Once you make a card base for a tri-shutter card, you can save your project. You can later open it up and add the extra pieces and setiments and "Save As" the name of a different project, that way you will always have your original card base to work from!! I felt a bond with SweetSassyDiva a while ago on facebook as we are both working hard at losing weight. We have been passing back and forth praise and support! I have been a follower of her blog for a while now and when she announced a Design Team Call I thought it sounded like a lot of fun. I wanted to make sure I had enough time to dedicate to her blog, so I kind of waited until the last possible minute to decide.....and I am so glad I did!!! I am super excited to be on her Design Team!!! Here is my Day at the Beach Layout and how I created it. Usually I start every layout with the pictures, but every now and then I do it backwards! For this one I started with the paper!! I used my Creative Memories wavy cutter to trim my blue paper into waves. I adhered the larger wave onto the sand colored cardstock (on the bottom) and pop-dotted the shorter wave on top of it. I tore my blue cardstock for the sky, inked it with Vintage Photo ink and adhered it to the top of the sand colored cardstock for my sky. On my Gypsy, I opened up a new project with a 12x24 mat. From Life is a Beach, I put two beach chairs (3.32w x 3.00h) on my screen. I flipped one of the chairs sideways so they are leaning towards each other. I put a beach umbrella on the screen and sized it to 4.29w x 4.29h. I grabbed the sun from Just Because Cards and sized it to 3.13w x 6.85h. I grabbed the water duckie tube toy from H2O and sized it and the layer piece at 2.67w x 1.92h. I used Cherry Limeade for my font and put the words DAY and BEACH at 2" height on my mat. I welded "at" on top of "the" (both at 1" height) and then sized a cloud from Create A Critter to 3.09w x 3.27h to fit the "at the" on it. My favorite part was welding the sand castle border from Life is a Beach to make a border. I opened up Layer 2 and put 2 borders on my mat at 1" height. I used my Y axis to line them up and welded them together. Then I changed the width to 12" for a true 12" border. I started my border at 1" and ended it at 13" on my 12x24 mat, then cut out two. I glued down the sand castle borders just above the waves. On Layer 3, I copied and pasted the umbrella two times because this cart does not include layers. I hid the inner cuts on one of the umbrellas and cut it out in silver paper. I trimmed off the pole of one of the other umbrella that I cut out in the star paper. I used purple stickles to outline the seams on the umbrella. On Layer 4, I copied and pasted two suns, the duckie pieces, the chairs and the cloud. I also put a circle on my mat at 1.26w x 1.21h for the inner circle of the sun. I cut out the sun pieces and the layer of the duckie in yellow and the rest in white. I inked the sun pieces and the chairs in Vintage Photo, and the cloud in light blue. I assembled the pieces of the sun and duckie. I set the chairs and umbrellas on my page to make sure I had enough room for my 4x4 photo. On Layer 5, I copied and pasted the title which I cut out of dark brown cardstock. I used the same cardstock to mat my photos. I used the negative piece as a guide to glue down my title perfectly straight. I glued the "at the" onto the cloud. I put the duckie in the water off the page and trimmed him up. I glued down one of the sun pieces and then pop dotted the other sun piece with the circle on it. I made a towel out of some red ribbon and I glued it over one of the chairs. I glued down the chairs and umbrella. I pop-dotted the chair on the right so it looked like the umbrella was further back. I added some baker's twine on the photos. I also added some Jolee's sea shell/gem embellishments on one corner of each photo and along the sand castles. In order to fit my photos in the layout, I trimmed two of them to 4x4. These photos were from our vacation last summer in the Ozarks. And here is my "Beach" project, a 2-page layout that is almost as cute as the boys in the photos!!! Thanks again SweetSassyDiva!!! I am so excited (did I say that already?) to be on your design team!! I am on the Design Team at SweetSassyDiva!!! Be sure to check out her awesome blog and please come back tomorrow to see my first project!!!! 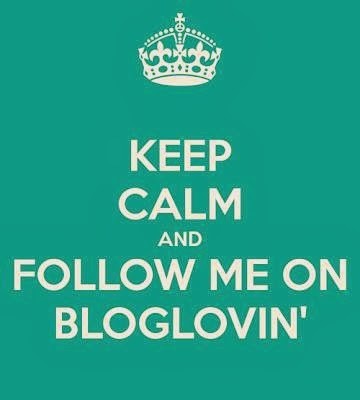 This month, the challenge at Scrappin Chics Challenge Blog is a Kitchen theme. I was going to do a layout of my kitchen remodel, but I am afraid that will end up being 4 pages!! I did not have all the pictures handy, so I made a list of other projects (below) and my Grocery List Note Pad seemed the most fun! I thought 3x8 would be a good size for a note pad, so I cut two pieces of watercolor paper and one piece of scrapbook paper to 3x8. I took some loose leaf notebook paper and trimmed it to 3x8. I wanted to have lines on my paper. I dusted off my Bind-It-All. I used my ATG gun to adhere my paper to the front cover and then punched the holes in both the cover and back pages. Next I punched the holes in the notebook paper. I welded a bunch of words using Don Juan. These words are common items from a grocery list. I ran the mesh of words through my Xyron. I rubbed the backing paper as I pulled it off the word mesh. and put the o-wires through the holes. I put the notebook back in the Bind-It-All and squeezed the wires closed. Here is the notepad with the wires in. Here is the inside of the note pad. I added a little twine and a metal "doo dad" because it needed a little something and my metal one was flat. Would have preferred a food item, but did not have one handy. 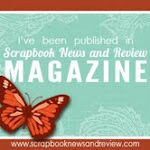 It is not too late to create a kitchen project and post it on the Scrappin Chics Challenge Blog!